Henri Matisse (1869-1954) has risen to rock star celebrity. He is beloved throughout the world. 500,000 people packed the Tate Museum in London last summer to see his show. The Tate turned the final weekend of the run into a kind of all-night sleepover to accommodate the crowds. Matisse said this was the best work of his long career. In the years around 1940, Matisse must have felt he was living a nightmare. In 1939, he and his wife of more than four decades legally parted ways, at her instigation. Two years later, he was found to have abdominal cancer and underwent a grueling operation. During World War II, he fled Paris, only to have the danger of war follow him. 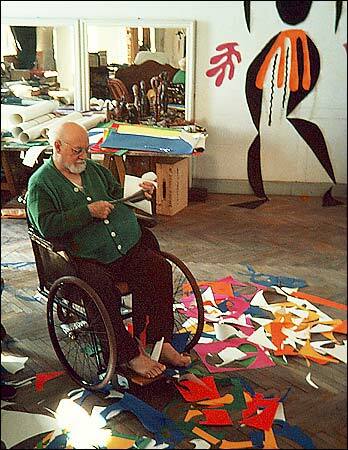 At 71, bed- and wheelchair-bound, Matisse couldn’t paint, couldn’t sculpt. But he could use scissors. Assistants painted large pieces of paper in colors chosen by Matisse. Then the invalid artist cut them into wild and surprising shapes. At his direction, the assistants pinned them on the wall of his hotel suite. The result: works of brilliant and dimensional complexity, works that were not quite painting, not quite sculpture, and — this was the really radical part — not necessarily permanent. Nevertheless, some of the most joyous and creative art ever produced! Take a look at Matisse’s Cut-Outs at the Tate Modern in London. Click here if you are unable to view the video. Thanks for sharing this beautiful, inspiring video. Kirby, You do such fine work. I enjoy your emails so much. It seems that using a pair of scissors would be far more difficult than wielding a brush or manipulating a hunk of clay w/ one’s supple fingers, so I’m guessing Matisse, although NOT malingering, merely decided he wanted to approach his art from a different perspective. He certainly did. Once a master, always a master. Thank you, Kirby. 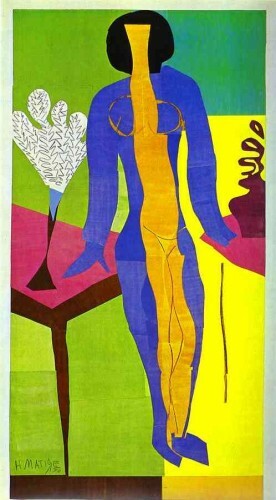 Back from my trip to New York and delighted to see your Blog on the Matisse Cut-Out Show. It brought found memories of time spent at MOMA viewing this fantastic show. The first figure you presented was my favorite in the show. There was no information on the audio program I rented that told about the circumstances Matisse found himself in at that time so I appreciated reading your accounting. Happy to see your Blog and that your creativity is thriving!!! Very interesting and informative piece, Kirby. Kind of familiar with Matisse’s work but knew little about his life. His latter days sound difficult but some how he managed to persevere and continue his passion for art. How great. Inspiring. Good job, girl. Great!! Very interesting. I sent it on to my artistic friends. Hope all is well. Thank you. At MOMA in NYC, I was impressed by how Matisse began with paper cut-outs to designed stained glass windows for the chapel in Vence, France. To this day, churchmen wear vestments designed by Matisee to play — just so — with light streaming through his windows. Thank God for Matisse!! He brought so much color & joy to our world. You told me things I didn’t know about that wonderful artist. Do you suppose he just couldn’t lift his arms up to paint? Amazing that he didn’t let life stop him from creating. I’m so glad he decided to return to scissors. Thank you Kirby. This was fun to read, Kirby, especially since we were just at MoMA for that AMAZING Matisse show. Never heard before that he thought that was his best work. It certainly was very arresting work to see in person . Thanks for sending. Thank you for spotlighting Matisse. A great master indeed, and his late work exemplifies the triumph of the spirit over all physical obstacles. Even Picasso, not noted for paying compliments, said “In the end, there’s only Matisse.” How right he was. Inspiring! 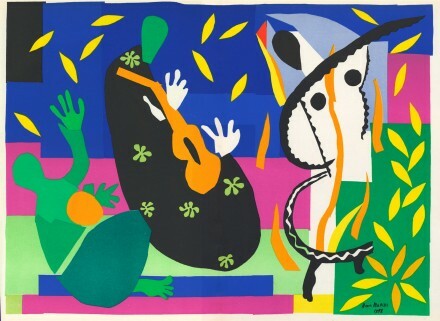 Enjoyed today’s blog post – I love Matisse’s cutouts – I have fond memories of seeing them at the National Gallery for the opening of the west wing – when was that, 1980 or so? OMG Kirby! Just discovered your video blogs this morning! Learned so much. Especially loved the Jamie Wyeth video. Thank you so much for sharing! You always amaze me with your choices and imagination! Thank you Graham for putting you in my world. Oh Matisse is such a huge inspiration! I really really wish I could have seen this show at the Tate – it must have been magnificent. The video is great – it shows so many beautiful pieces as well as explaining this work very clearly and succinctly. Thank you so much, Kirby, for posting this. It’s wonderful! I will be having my grandchildren playing with construction paper and scissors during the week and selling their creations at the art marts on the weekends. Fascinating, Kirby! Thanks for the enlightenment. I have always appreciated Matisse’s work but did not know anything about him. That’s an amazing story .